The rad pictures my doctor took of my insides. Top picture is my more normal ovary. 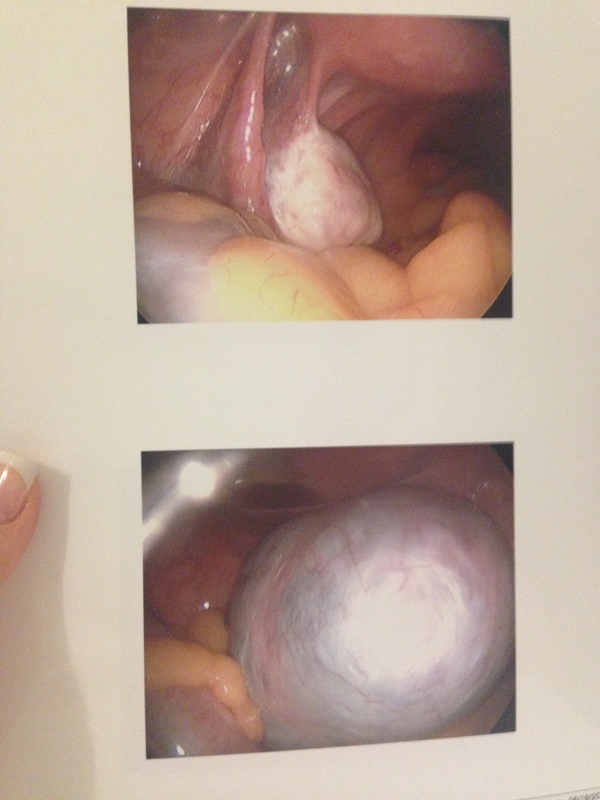 Bottom picture is my now former-ovary. I used to know just how much bigger it was than the normal one, but it slips my mind right now. Let’s just say it was in the “freak show” category. When I went into the hospital, my marching orders were something like “unilateral salpingo-oopherectomy, possible cancer staging, possible bilateral salpingo-oopherectomy, possible hysterectomy.” Talk about coming to terms with things. When you have one nurse administering your IV while another reads you this, you just have to take a deep breath and accept things. When I came-to, all I heard was that the frozen biopsy was benign. My husband told me this, because the doctor told HIM this. Good news. We were given pictures from my insides, which honestly I find fascinating, but I didn’t learn what all happened until my follow-up visit 3 weeks later. At my doctor’s appointment, I found out that my tumor (that’s another fun word to come to terms with) had grown even more since my last ultrasound. It was inside my ovary, which I knew (which, in fun internet research I found out is super sketchy and cause to worry), and which is why they had to remove the whole ovary. Had the tumor been just on the outside, I could have kept it. Nope, not me. I had to be special. And then, I was told just how special I was. Yes, the tumor was benign, but the fun started with the pathology report a few days later. The kind of tumor it was is called a stroma ovarii. Teratoma’s are a common tumor in ovaries–basically, it’s a germ cell from an egg that has gone a little nuts. There are stories of hair or teeth in these. My mom has a background in ultrasound, and when I’d read her the report, she would tell me about teratoma’s (when she wasn’t abnormally quiet…which I know was because she knew the severity of what I was reading her). My recovery was good. I did get an infection right before my post-surgical visit, which cleared up quickly. They did my surgery laproscopically, so I have a 1/2 scar on either side of my torso, and a few in my belly button. The belly button took the longest to heal. I can tell you though that I’m still waiting for my body to catch up hormonally. One of my biggest fears was having both ovaries removed, because at 35, I didn’t want to go into surgical menopause. I’m not going through menopause, but I am having wicked hot-flashes, followed by periods of intense cold. My remaining ovary will pick up the slack (or so I’m told), but it’s being a little sluggish. Awesome. After my surgery, my temp got down to 93.5 (this was like 3 days post-op). I called nurse on-call, who wanted me to be seen immediately. My doctor, however, said the simplest way to deal with this was to stop taking my temp. Hmmm. I haven’t taken my temperature since, but I know it’s still really low. (It’s always been low…and now with my pseudo-thyroid gone, I’m certain it’s gone even lower.) Most of this is probably thyroid issues, but yeah, those hot-flashes are ALL gynecological. Life is back to normal now, but it was a constant state of stress all spring. There’s another “growth” on my remaining ovary, which I’m going to need to follow up with at some point, but I don’t feel like scaring myself again. And thus concludes what I hope is my last TMI girly health entry. Back to writing! Back to self-doubt! Back to rejection letters!